It's an art journal. 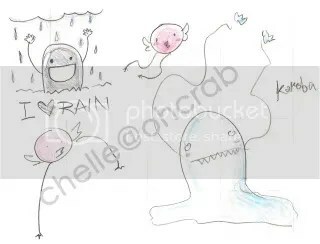 Chelle's art journal. 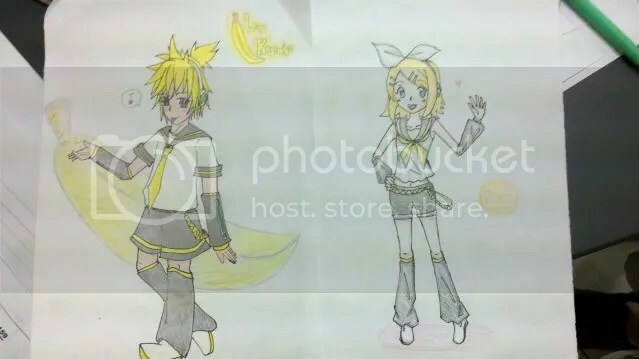 I had an art trade deal with my friend V at school, I drew Kagamine Rin (right) and she drew Len (left) 😀 Our styles are really different, which makes drawing with her . For instance, she says she can’t draw cute girls while me on the other side can’t draw good-looking guys, she can draw scary dragons while I can only draw bubbly creatures to save my life. So yeah, it’s fun to mingle with people who are different than you because it makes you learn new things. So today my good friend since elementary school came over to play. Then we produced this out of nostalgias and just plain silly randomness. Click to see them in larger size on dA – proceed with caution. 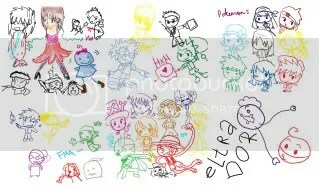 That picture contains our shared fandoms (plus some extra decorating random things), which are… Well, see if you can point them out: Yu Yu Hakusho, Full Metal Alchemist, Hunter x Hunter, Pokemon, and One Piece. Em… ya, it wasn’t Da Vinci quality, but we had good laughs when doing it. An additional picture to make this post to look more ‘sane’. Or something like that. My anatomy skills still need some work. Ho hum. After our last collaboration work in 2009, I finally got a chance to finish another collaboration with Josephine (or mostly known in dA as Iphin). She did the lineart and colored the boy, while I colored that cow and the girl. Click to go to the deviantART page 🙂 What do you think about it? She’s a good friend of mine since elementary school, so it’s exciting to finally work on something together like this. 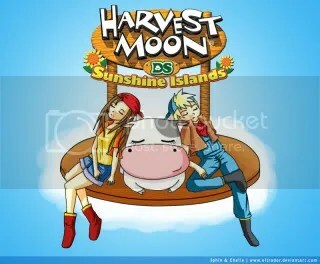 Over years we have shared many fandoms, from Yu Yu Hakusho to One Piece, and Harvest Moon is one of our favorites. I love doing collaborations with other people, and I appreciate the internet which allows me to work with artists on the other sides of the world. Some other collabs I’ve done are here and there. By working with others I can learn a bit of how other people work on their drawings and how to improve my work by getting their comments. So, if you’re interested for collabs feel free to contact me, hehe. Ta-da~ Click on the logo to go to the website! MatiBeku itself means “frozen to death“, hence the ice-y look. (Don’t say anything if you think it doesn’t look like ice.) Oh, and don’t bother asking me about the riddles though since I don’t play them. Heavy photoshopped text for the win! 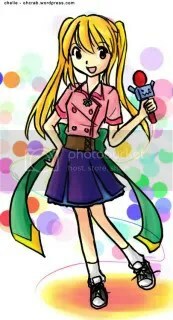 Hahaha not very creative and high quality I know =.=” Searched for tutorials all over the net but ended up experimenting on my own by abusing the filters (because I’m too lazy to read and wait for the pics to load, huzzah). This one is kinda old news, actually, but I’ll be posting this now. This is a website design I made with Hillary and Grace for a webdesign contest. I’m not the artist this time though, this time I do the codings instead while they do the graphics and animations. 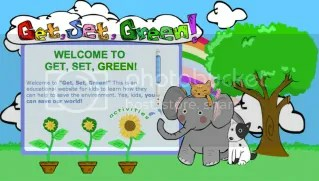 This is supposedly a website teaching environment care awareness to children. #58: All We Gotta Do… Just Collab! Collaboration with Hilly. I drew the girl and done the color, she drew the boy. 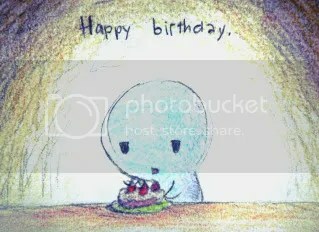 I find myself urging to keep posting so this place will stay alive… even I’m not sure why. My scanner screws these up. =( They’re much prettier in original (and I really mean it), colored by Gijo. I don’t think captions are necessary, but I hope you guys get the message. 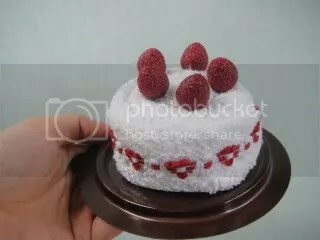 The second picture is inspired by this cake. Don’t be fooled, it isn’t edible – it’s made from towel! Isn’t that cute? You can see more of this kind of ‘cake’ here. More of these random creatures are appearing on my notebooks and handouts. I decided to name the rectangle one with loooong wiggly arms as “Kokoba”. Haven’t got the name for the tiny round one though. Special thanks to Gijo, Hilly and CH who made my drawing book so colorful with you guys’ wonderful coloring skills. First of all, thanks for visiting. Well, this is where I post my doodles, so-called "artwork" and photos, combined with some of my random rants and thoughts. 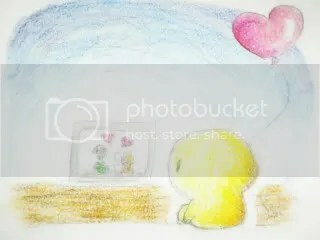 I'm still in learning process (and will always be), so I do realize there are still lots of things I need to improve. Feel free to lurk around, comments will be greatly appreciated. Have a nice day!